James B. Irwin drove the first Lunar Rover on the moon as Lunar Module pilot on the Apollo 15 mission in 1971. Irwin was born March 17, 1930 in Pittsburgh, Pennsylvania. He received a Bachelor of Science in naval science from the U.S. Naval Academy in 1951 and Master of Science in aeronautical engineering and instrumentation engineering from the University of Michigan in 1957. Upon graduation from the Naval Academy, Irwin was commissioned in the U.S. Air Force and received his flight training at Hondo Air Force Base and Reese Air Force Base, both in Texas. He served with the F-12 Test Force at Edwards Air Force Base, California, and with the AIM 47 Project Office at Wright- Patterson Air Force Base, Ohio. He was graduated from the Experimental Test Pilot School in 1961 and from the Aerospace Research Pilot School in 1963. Irwin was chief of the Advanced Requirements Branch at Headquarters Air Defense Command when NASA selected him as one of 19 new astronauts in April 1966. He was backup Lunar Module pilot for Apollo 12 before being named to the prime crew for Apollo 15, along with Commander David Scott and Command Module pilot Al Worden. The trio blasted off for the moon on July 26, 1971, and three days later, Scott and Irwin landed their lunar ship “Falcon” in a narrow valley hemmed in on three sides by the 15,000-foot-tall Apennine Mountains and on the fourth by a mile-wide canyon named Hadley Rille. Theirs was the first extended scientific expedition to the moon and the first to use the Lunar Rover – a dune buggy-like vehicle which the astronauts drove across the dusty terrain at a top speed of 8 mph. During three separate outside excursions over three days, Scott and Irwin traversed far and wide around the Hadley-Apennine region, collecting 171 pounds of samples, taking photographs, drilling core samples and vividly describing the scene for Earthlings. Irwin retired from NASA and from the Air Force, with the rank of colonel, in 1972. A very religious person, he founded the High Flight Foundation, a non-profit organization devoted to sharing Irwin’s faith in God through speaking engagements, publications and retreats. He made several trips to Turkey’s Mount Arafat in an unsuccessful quest for Noah’s Ark. Irwin served as chairman and president of the foundation until his death from a heart attack on August 8, 1991, in Glenwood Springs, Colorado. 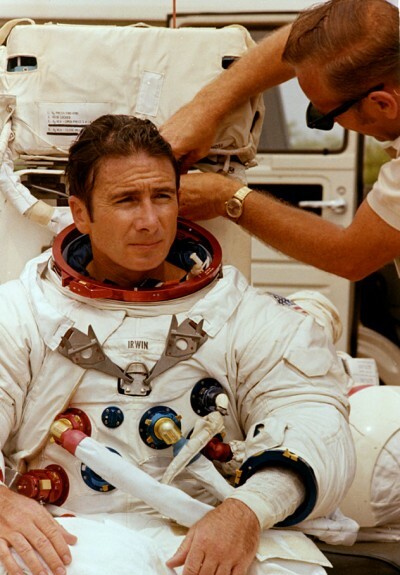 James Irwin was inducted into the U.S. Astronaut Hall of Fame on October 4, 1997.